Community members wrote messages on canvas at the campus gathering. Interim Vice Provost for Student Success Jaye Padgett spoke to the crowd. 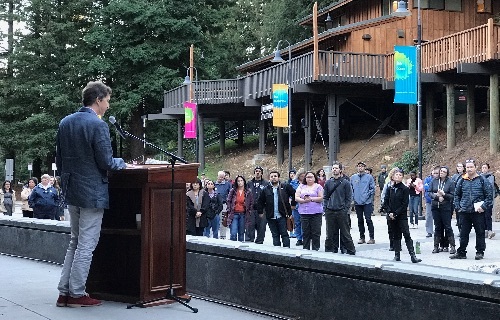 Students, faculty, and staff came together Wednesday afternoon to reaffirm the values and principles of UC Santa Cruz and support the needs of the community. “Our campus is committed to all of our students, and our entire community, regardless of anyone’s race, ethnicity, disability status, gender, sexuality, gender identity, religion, immigration status, or whatever challenging life experiences they’ve faced,” interim Vice Provost for Student Success Jaye Padgett said. Padgett noted that the division includes resource centers, Student Organization Advising and Resources (SOAR), Learning Support Services, and more. Other speakers included Campus Provost/Executive Vice Chancellor Alison Galloway, interim Dean of Students Lucy Rojas, Academic Senate Chair Olof Einarsdottir, and Kresge College Provost Ben Leeds Carson. 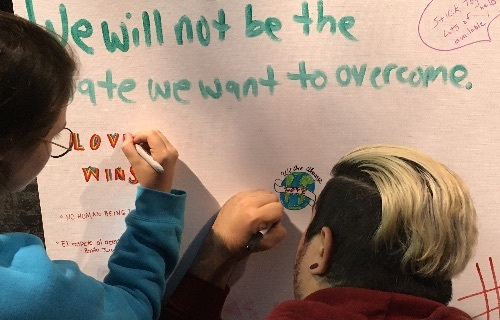 After the brief speeches, members of the campus community wrote messages on canvas as part of an art project.